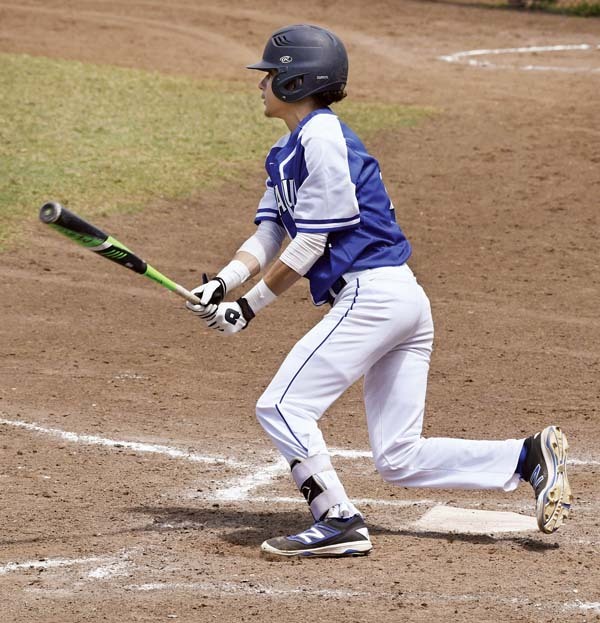 The Maui High School baseball team finished a three-game sweep of King Kekaulike to open Maui Interscholastic League play this weekend, beating Na Alii 5-1 on Saturday at Maehara Stadium in Wailuku. Rayven Ruiz pitched a complete-game five-hitter for the Sabers (3-0), who outscored King Kekaulike 18-2 in the three games. Ruiz struck out four and walked one. Hauoli Caliva was 3-for-3 with a run scored for the Sabers, while Haoa Jarnesky was 2-for-2 with an RBI. Kellen Caluag had a double for Na Alii (0-3) and Matthew Hackett was 2-for-3 with a run. At Maehara Stadium, the Bears beat Lahainaluna for the third straight day as four pitchers combined on a three-hitter. In his MIL season debut, Bubba Hoopii-Tuionetoa struck out six and walked one in three innings of work. Bubba Varner, Chayce Akaka and Nainoa Keahi all added one inning of scoreless relief. Baldwin (3-0) scored six runs in the top of the second inning and added three more in the third. Haku Dudoit was 3-for-3 with a double, triple and three RBIs for the Bears. Baldwin outscored Lahainaluna (0-3) 33-2 in the three games. At Maehara Stadium, the Farmers finished a two-game sweep of the Trojans in MIL Division II play by scoring four times in the top of the sixth inning to break away from a 3-3 tie. Shraedon Naeole-Starkey pitched a complete-game five-hitter for the Farmers (2-0), while Nainoa Kaahanui was 3-for-4 at the plate with a run and an RBI. Chris Neilson was 2-for-3 with a run for the Trojans (0-2), who committed eight errors. At Eddie Tam Field, Parker Almeida, Lucas DiMartino and Kanen LaMonica combined on a four-hitter on the mound as the Spartans finished a two-game sweep of the Pine Lads. Almeida picked up the win with three innings of work, allowing two earned runs, striking out three and walking three. Jack Almeida drove in two runs for the Spartans (2-0) — five different players had one hit apiece. Seabury Hall scored six runs in the first inning and four more in the second. Naighel Calderon was 2-for-4 with three RBIs and two doubles, and J.P. Thompson was 2-for-3 with a run scored for the Pine Lads (0-2), who committed six errors in the game. Rayven Ruiz and Hauoli Caliva; Michael Beesing, Gavin Grossman (5) and Koa Hashimoto. W–Ruiz. L–Beesing. 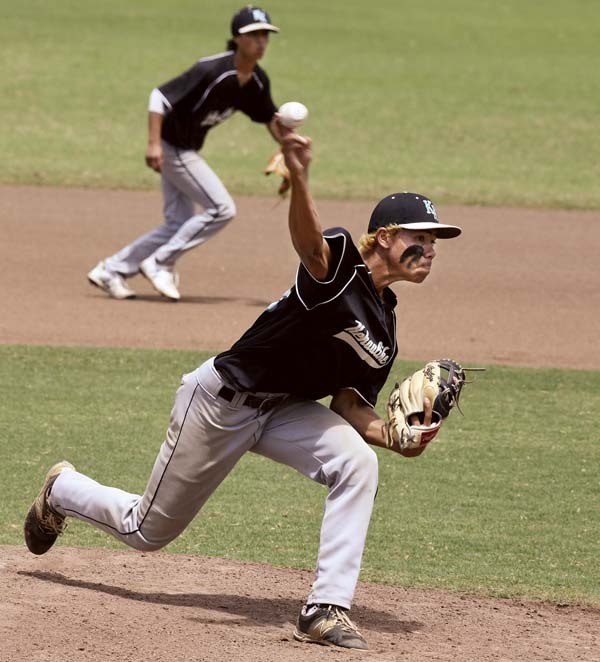 2B–King Kekaulike: Kellen Caluag. 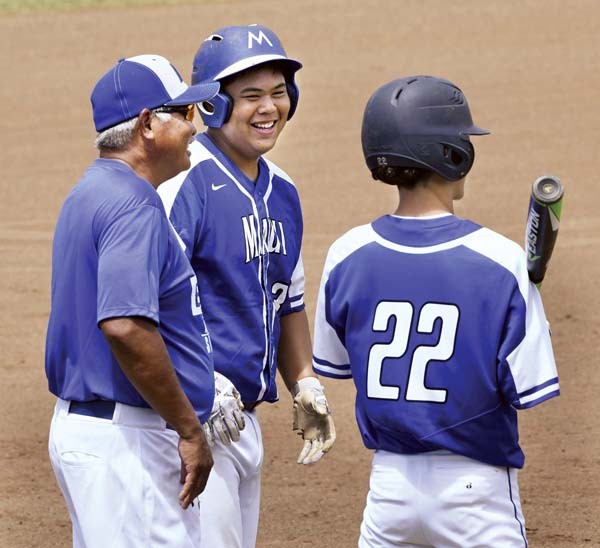 Leading hitters–Maui High: Caliva 3-3, run; Haoa Jarnesky 2-2, RBI. King Kekaulike: Matthew Hackett 2-3, run. Bubba Hoopii-Tuionetoa, Bubba Varner (4), Chayce Akaka (5), Nainoa Keahi (6) and Cade Kalehuawehe; Kamahao Acpal, Raige Bush (5) and Kalewa Kalanikau. W–Hoopii-Tuionetoa. L–Acpal. 2B–Baldwin: Haku Dudoit, Isaiah Kusunoki. 3B–Baldwin: Dudoit. Leading hitters–Baldwin: Dudoit 3-3, run, 3 RBIs; Akaka 2-3, 2 runs, 2 RBIs. Shraedon Naeole-Starkey and Kaimana Nakayama; Jake Gage, Bubba Chuckas (7) and Hunter Otani. W–Naeole-Starkey. L–Gage. 2B–Molokai: Cody Hunter-Hiro. Leading hitters–Molokai: Hunter-Hiro 2-4, 2 runs, RBI; Lassen Bush 2-3, run; Nainoa Kaahanui 3-4, run, RBI. St. Anthony: Chris Neilson 2-3, run. Naighel Calderon, Devin Vidad (2) and Kane Tubera; Parker Almeida, Lucas DiMartino (4), Kanen LaMonica (7) and Jack Almeida. W–Parker Almeida. L–Calderon. 2B–Lanai: Calderon 2; Seabury Hall: Ben Belew. 3B–Seabury Hall: Jacob Luther. Leading hitters–Lanai: Calderon 2-4, 3 RBIs; J.P. Thompson 2-3, run. Molokai at Lanai, 3:30 p.m.